Discover magazine reports that the Aral Sea Shows Signs of Recovery, While the Dead Sea Needs a Lifeline (80beats | Discover Magazine). Some great news for bringing the Aral Sea back as a habitat and a resource, but more terrible news about the Dead Sea, and a hard choice about what to do lays in the hands of the World Bank. Go take a look. Streetsblog Capitol Hill highlighted a very nice FTA report that tracks urban transit emissions. A pdf of this report appears here. As I have ranted before here, we have to know ridership in order to make claims about emissions benefits. This graphic, taken from the report, does a good job of showing us this effect. 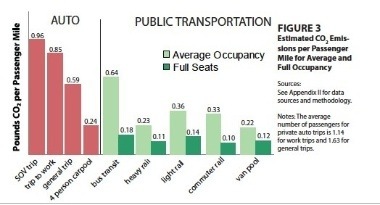 We’d be better off filling up cars on the road than we are running underutilized trains. Now, this is a much different story if we are getting people to use the trains. 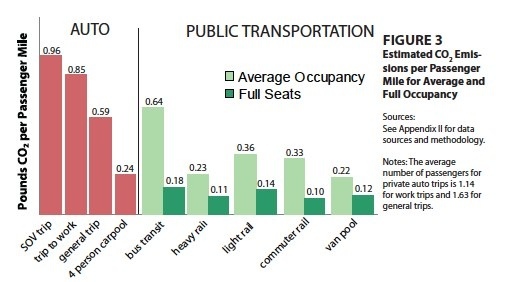 This is why a reasonable accuracy in ridership forecasts matters. I’m not asking for perfection; I’m asking for an honest assessment of how many people we’re building something for so that we can fairly assess what we are doing here. The other possible way of changing this figure would be to change the feedstock of the energy sources for all of the vehicles. Cleaning up electricity generation would change the emissions per passenger mile.